Latex classes are really useful as they provide ready and easy to use implementation of complex formatting, styling and rendering methods. In fact, it is one of the most interesting feature of the latex system. Choosing a class (and packages) is thus a critical issue prior to write any latex document. Choosing THE class suited for your project's needs may save you a lot of time wasted to implement basic features and manage packages incompatibilities and limitations. Actually, I am using only a limited and general set of classes: article, beamer, report and book. But these classes do not allow me to do all I'd like to, at least in a rapid and easy way. Searching for specific solutions to my problems one by one as the arise in the writing process has not been a satisfactory strategy and generated a lot of frustration. As my problems maybe be complex, multiple, interrelated and evolve during my writing projects, specific solutions found are often incompatible with my previous work or need a complete redesign of my implementation or are ugly-and-drawback-prone patches. My question is: Is there a comprehensive overview of the different latex classes? By comprehensive I mean: not necessarily the most complete and detailed ressource, but concise informations focused on existing classes' capabilities, forces/weakness, limitations, use of packages and incompatibilities with other packages. The texlive package database has a one line description of each (texlive) package, derived I think from the ctan catalogue. Support for designing posters on large paper. Macros for Manuscript Preparation for AAS Journals. Typeset technical and scientific Brazilian documents based on ABNT rules. Class for ACM conference proceedings. Class for typesetting ACTIVE conference papers. Australian Defence Force Academy thesis format. Styles for American Geophysical Union. A collection of packages and classes. Official American Meteorological Society Latex Template. AMS document classes for LaTeX. Typeset articles for the Annals of Mathematics. Format documents in APA style (6th edition). Format manuscripts to APA 6th edition guidelines. Macros and fonts for typesetting Arabic. LaTeX class for articles published in INGENIERIA review. Typeset a thesis at Bangor University. A LaTeX class for bank statements based on csv data. Class for book-type documents written in Basque. A LaTeX class for producing presentations and slides. Beamer, using the style of FU Berlin. Class for producing books for the publisher "Teubner Verlag". An exam class designed for Mathematics Teachers in China. A biblatex style for citations in musuos.cls. Bidirectional typesetting in plain TeX and LaTeX, using XeTeX engine. A class for book covers and dust jackets. Class for Brandeis University dissertations. Document classes based on jsclasses. Business letters in the Italian style. Class for typesetting letters to Swiss rules. Typeset working papers of the Czech National Bank. LaTeX tools and documenting facilities. LaTeX code and documentation in LaTeX-format file. Bundle individual documents into a single document. Class for the journal Computational Complexity. Keeping track of formal 'concepts' for a particular field. A set of tools for generating conference proceedings. Generate calling cards for dances. LaTeX class for articles submitted to the CSTUG Bulletin (Zpravodaj). LaTeX classes and packages for Chinese typesetting. A class for making curriculum vitae. LaTeX CV class, with extended details. A LaTeX version of CWEB. Commutative diagrams in a LaTeX and TeX documents. Books and tutorials from the "Dickimaw LaTeX Series". Class and templates for typesetting dissertations in Russian. Document class and bibliographic style for French law. BibTeX support for submitting to Economics journals. A fancy Curriculum Vitae class. Examples from the book Einfuhrung in LaTeX. Class for EJP and ECP. A LaTeX document class for the Journal of Electrical Bioimpedance. Class for articles for submission to Elsevier journals. Thesis class for ELTE University Informatics wing. Typeset business cards, index cards and flash cards easyly. Produce output similar to that of APJ. Style for Reports by US Army Corps of Engineers. Style for Munitions Management Project Reports. Unofficial class for European curricula vitae. Package for typesetting exam scripts. LaTeX class for typesetting exams. Exam class, focused on collaborative authoring. Extend the standard classes' size options. Typeset and calculate invoices according to Venezuela law. Custom presentation class built upon LaTeX Beamer. Computer Science thesis class for University of Dortmund. A class for typesetting flashcards. Typeset letters in the French style. A class to typeset La Gaceta de la RSME. Geneva School of Economics and Management PhD thesis format. A CV document class with a vertical timeline for experience. Class for writing "juristiche Hausarbeiten" at German Universities. Replacement for the LaTeX classes. A class for academic reports, especially PhD theses. Flexible letter typesetting with flexible page headings. LaTeX support for Croatian documents. Class for typesetting articles for the ICSV conference. Macros for IEEE conference proceedings. Document class for IEEE Transactions journals and conferences. LaTeX Class for the Israel Journal of Mathematics. Create an overview of pictures from a digital camera or from other sources. Generic ISO standards typesetting macros. A LaTeX class for typesetting letters and invoices. Halle Institute for Economic Research (IWH) Discussion Papers. Class files for the Journal of Machine Learning Research. Document Class for Journal of the Physical Society of Japan. Classes tailored for use with Japanese. A document class for German legal texts. Document classes for Karel de Grote University College. Print tables and generate control files to adjust kernings. Typesetting a beuatiful CV with various style options. A LaTeX document class for typesetting Korean documents. 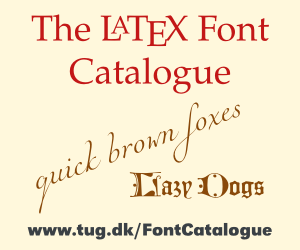 A complete set of fonts for text and mathematics. A TeX macro package that defines LaTeX. Prints the version and date of a LaTeX class or style file. Examples from The LaTeX Graphics Companion. Indent a LaTeX document, highlighting the programming structure. A structured copy of the LaTeX distribution. Letters and faxes in French. Typeset maps and blocks according to the Information Mapping method. Class for "Logic and Philosophy of Science". Provide a graph datastructure for experimental LaTeX3. Examples from the book "Einfuhrung in LuaTeX und LuaLaTeX". A guide to use of LaTeX with LuaTeX. Mathematics in accord with French usage. Examples from the book Typesetting Mathematics with LaTeX. Framed environments that can split at page boundaries. Format written minutes of meetings. Typeset fiction, non-fiction and mathematical books. A basis for books to be published by Mentis publishers. Samples from Math into LaTeX, third edition. A modern curriculum vitae class. Class for Michigan State University Master's and PhD theses. Thesis class complying with Marquette University Graduate School requirements. Typeset papers for the department of music, Osnabruck. Classes for University of Manchester Dept of Computer Science. Prepare papers for the journal Nature. Notre Dame Dissertation format class. North Dakota State University disquisition class. Write letters, facsimiles, and memos. A class for NIH grant applications. Tool to prevent paragraph indentation after environments/macros. LaTeX class for No Starch Press. Class for the NRC technical journals. "European" versions of standard classes. Typeset books following classical design and layout. Class for Office of Naval Research Ocean Battlespace Sensing annual report. Versions of article class, tuned for scholarly publications. Print Tibetan text in the classic pecha layout style. A class for small advertisements. Managing the options and loading order of other packages. LaTeX template for dissertations in Peking University. Facilitates mass-mailing of postcards (junkmail). Powerdot, using the style of FU Berlin. Examples from the book Presentations with LaTeX. A class for typesetting press releases. A class for preparing proposals. LaTeX class for high quality slides. A class for minutes of meetings. Examples from Przechlewski's LaTeX book. A TeX system for publishing in Japanese. Macros for 'Progress of Theoretical Physics'. A LaTeX class to typeset recipes. Typeset recipes in note-card-sized boxes. Typeset articles for the journal Res Philosophica. Typeset a resumee in both Chinese and English. Styles for various Physics Journals. Class for Ryerson Unversity Graduate School requirements. Format papers for the annual meeting of EEGS. Typeset theses for Sapienza-University, Rome. Support for teachers at German schools. Typeset the German chess magazine "Die Schwalbe"
A class file to typeset screenplays. LaTeX template for theses at Southeastern University. A collection of LaTeX packages and classes. Typeset notes containing rich content, in the margin. A simple class for writing curricula vitae. Tools for a repository of long-living documents. Documentation and extraction for packages and document classes. Key-value parsing combining features of xkeyval and pgfkeys. 'Simple' class for reports, etc. Support for formatting SPIE Proceedings manuscripts. Slides with headers and footers. Compile TeX pictures stand-alone or as part of a document. Individual typesetting of subfiles of a "main" document. A document class for typesetting theses, books and articles. A template for the University of Tabriz. A LaTeX class for presentations. The TeX Directory Structure standard. Create dynamic online presentations with LaTeX. Thesis class for Eszterhazy Karoly College. Thesis template for Tsinghua University. Create scientific posters using TikZ. Documentation macros for the TKZ series of packages. Examples from "The LaTeX Companion", second edition. Bundle for typesetting multilanguage theses. Typeset documents in the corporate style of TU Dresden. Document classes inspired by the work of Edward Tufte. LaTeX macros for TUGboat articles. Thesis style for the University of the Andes, Colombia. Create Turabian-formatted material using LaTeX. Formatting based on Turabian's Manual. University of Arizona thesis and dissertation format. Course texts and masters theses in University of Antwerp style. Document class for theses at University of Alaska Fairbanks. A thesis/dissertation class for University of California at Davis. University of California thesis format. Thesis class for the University of Duisburg-Essen. A LaTeX class for writing exercise sheets. Class for UIUC thesis red-bordered forms. Thesis class and templates for Universite Laval. University of Michigan Thesis LaTeX class. Dissertations at the University of Michigan. Position decorations over and under expressions. Class for dissertations and theses at the University of Oregon. Document class for dissertations at the University of Wollongong. Writing specifications such as for UP-based methodologies. Beamer and scrlttr2 classes and styles for the University of Regensburg. U.S. Patent Application Tools for LaTeX and LyX. University of Toronto thesis style. Slides with a simple Power Point like appearance. University of Washington thesis class. LaTeX class for Bavarian school w-seminar papers. Persian for LaTeX, using XeTeX. Extension of the keyval package. Macros for documentation of LaTeX classes and packages. A thesis class file for York University, Toronto. Not the answer you're looking for? Browse other questions tagged packages document-classes book-design or ask your own question. Where are the texdocs for the built-in LaTeX document classes? How to configure a custom class such that consumer settings must be loaded before the class settings? How many LaTeX classes and packages are there (say, on CTAN)? How do I list the available classes in my installation? How does Latex compilers integrate packages into its existing core functions? How to define the document class parameters?